This is an amazing post. 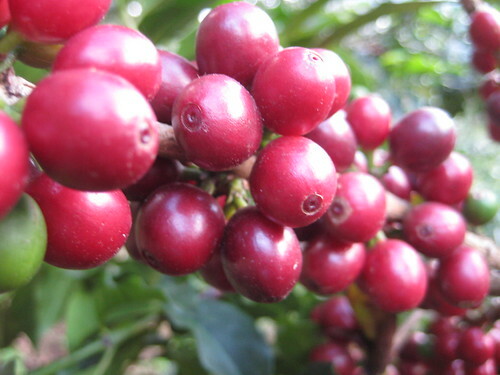 I am very interested in coffee production and the coffee farmers. So sorry to hear about the loss due to high wind. Lamento que vayan a tener una cosecha reducida, y espero que puedan recuperar las perdidas con un mayor precio. Por otro lado, queria preguntarte como le fue a Noe en el campeonato local, y si sabes como se lo puede ubicar (no tuve suerte con su mail). That is incredible to read. I love you guys. I have been reading your blog and visiting your website for long now. However I could not stop my self from posting a comment here. Harvest is the epoch of nature’s magic, infusing life and love in its produce. We in India celebrate it with great joy and love. Every region from the hills of the north to the beaches and ghats( Where most of our coffee is grown- The much despised Monsoon Malabar is grown here as well) to the plateaus celebrates in its own unique way. I belong to the family which has traditionally been growing mangoes and litchis along side the grains and veggies. Our official harvest season started on 14th of January. People in my village roast a part of the first harvest and offer it to the people participating as an offering , after which the celebration begins with songs sung for the bounty of nature and praising it for all that it does for us. Obviously the quintessential Indian food is prepared and served.It is always like that one year we would have a bumper crop and the next year we would not expect it to be the same or the year after. How similar! I wish you and your family a great crop.